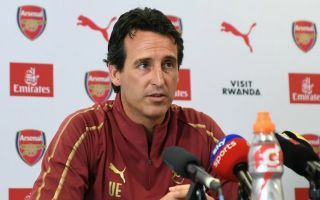 Arsenal manager Unai Emery is reportedly ready to let Danny Welbeck leave the club on a free transfer in order to make room for new signings – and for in-form loanee Reiss Nelson. The teenage winger has been in superb form since moving to Bundesliga side Hoffenheim on loan this summer, looking one of the most exciting young talents in the English game. Unsurprisingly, this seems likely to lead to a first-team chance for Nelson next season, with Welbeck the player to make way as he won’t be given a new contract, according to the Times. Arsenal fans will likely recognise this is a good move by Emery, with Welbeck a hard-worker and reliable backup option, but certainly not the best player in the world by any stretch of the imagination. The Gunners surely need to be aiming higher if they are to get back to being serious title contenders, and Nelson looks a young player with the talent to make it right to the top. The 18-year-old surely has a higher ceiling than the injury-prone Welbeck, and looks to have done enough to convince Emery he’s worthy of a place in his plans for the near future.